When Samsung launched the Galaxy S10 range there was one phone it announced that wasn't released with the rest – the Samsung Galaxy S10 5G. However the phone is now available to purchase, if you live in the right place. Samsung officially confirmed the release of the device in a post on its newsroom, stating that it's available to buy in South Korea immediately, although there's no word of an international release. What 5G phones can we expect in the future? Samsung nearly won the title of 'first commercially available 5G phone', but Motorola beat it to the punch by less than 48 hours with the release of a 5G mod for the Moto Z3 in the US, which lets users add 5G connection to the 2018 handset. When will you get the Samsung Galaxy S10 5G? 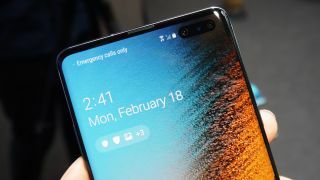 Since many other countries, including the UK, don't have functioning 5G networks yet, it's no surprise the Galaxy S10 5G is only launching in one region, but as the 5G connectivity grows we'll likely see the handset available in other places. According to a report from Bloomberg, the phone will be available to pre-order in the US from April 18, with a tentative release date of May 16 – if that's correct, it'll actually launch after the Samsung Galaxy Fold. In the UK, 5G is expected for later in the year, so we don't expect to see it there any time soon. When the Samsung Galaxy S10 5G is launched in other countries we'll let you know, so check back regularly for updates.